Adding some spice into your life could be just what the doctor ordered in terms of your health, and some spices really do have some great benefits. Take cinnamon for instance, a delicious aromatic spice known for its blood sugar regulating abilities, which in turn may help with weight contol. Cinnamon bark comes from the genus cinnamomom tree and has an ability to help curb those unruly SUGAR cravings. 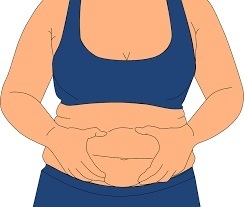 Too much sugar can lead to weight gain – specifically dangerous belly fat! Before we start, it is essential to understand some little known facts about cinnamon. There are actually 2 different types: Ceylon and Cassia; and although they both taste similar, they are very different in terms of health benefits. For Health Reasons, It is VERY IMPORTANT You Know the below Information About Cinnamon Before You Buy it!!! Ceylon cinnamon is the more expensive kind, but it also has the superior health benefits; it has a flaky bark (see pic). The problem is, most people who buy pre-ground cinnamon from the supermarket will more than likely be consuming the cassia type. Cassia often comes from China, is up to 10 times cheaper than ceylon, and may actually be BAD for you if you eat it regularly. I will explain why shortly. Most cinnamon labels do not disclose which type of cinnamon they use, and it often just comes under the umbrella term of cinnamon; but pretty much ALL pre-ground super market cinnamon will be this cheaper variety. The issue with cassia cinnamon is although it does share some of the health properties of Ceylon, it is 1200 times higher in a substance called caumarin. This compound can be dangerous when ingested regularly (especially if you are going to start using cinnamon every day) and it can cause serious health problems, including liver and kidney damage. Luckily, most people don’t use cinnamon in high enough amounts for this to be an issue, as it is often just used as an occasional spice in bakery. But if you are going to be using it a lot you should buy the flaky bark variety of cinnamon bark and not the hard curls (see pic), and just grind it up yourself. This really is the only way to know that you’re getting the real deal unless you go to specialist herbal shops. Cinnamon may help with weight loss – and I’m talking belly fat loss specifically here, because of the effect it has on blood glucose. When we a eat carbohydrates of any kind, which includes all things sweet – flours, grains, starchy vegetables, pulses and fruit then insulin is naturally released from the pancreas to mop those sugars up. From there they will pushed into your cells to either be used for energy, or STORED AS FAT. Most of us are petty hooked on both sugar and high GI carbohydrates, and may even be on a sugar addiction roller coaster that consists of eating high GI foods, having an insulin response, and then (if those sugars are not burnt off as energy, which mostly they’re not) having them stored as fat. Cinnamon can help by decreasing the amount of glucose entering the blood after a meal by interfering with digestive enzymes, which in turn slows the breaking down of carbohydrates in the digestive system and therefore lowering a meal’s GI… cool huh? Cinnamon is a great addition to a weight loss program, however you should also be eating a low GI diet that is high in fibrous plant foods for not only better blood sugar control, but also because this type of diet contains lots of high antioxidant, anti aging superfoods such as fruits, vegetables, nuts, seeds, pulses and also lots of fiber to keep the digestive tract in tip top condition. A slower release of sugar also means less hunger pangs! Now to the crux of the matter – the slower those sugars are released into the bloodstream, the slower and more sustained release of energy you will get. This will not only stop you from craving more sugar or carby foods again too quickly, but will also make you feel fuller for longer. And that’s the point: stable blood sugar stops the cravings that make you gain weight, and cinnamon can play a role of helping to stabalise these blood sugars in the first place. Insulin is a hormone that is released by the pancreas to clear and transport sugars (carbohydrates) from the blood and into cells. The problem is, these days, many people are becoming insulin resistant due to this hormone’s over use in their high sugar diets. Insulin resistance is one of the main hallmarks of type 2 diabetes and metabolic syndrome. Cinnamon may actually reduce insulin resistance dramatically and it does this by helping insulin to function properly and lower blood sugar levels. As well as its powerful effects on insulin, cinnamon also lowers blood sugar in other ways by decreasing the amount of glucose to hit the bloodstream after you have eaten a meal. The insulin mimicking compound that cinnamon contains helps to vastly improve the uptake of glucose into cells (a good thing because insulin is a vital part of keeping blood sugar stable). Numerous studies have been conducted that now confirm cinnamon most certainly has anti diabetic properties, and at doses of 0.5-2 teaspoons a day can lower blood sugar levels by 10-29%. All of the above benefits lead onto the amazing benefit of anti aging too! A low GI diet and better blood sugar control will keep you looking young, and that’s an absolute FACT! All these sugar spikes and troughs actually accelerate the aging process, not just on the outside, but also on the inside too, meaning higher risks of many age related diseases. 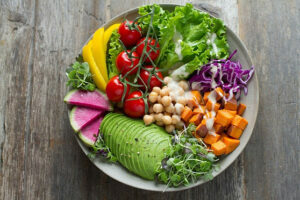 A low GI diet, and the blood sugar control that naturally comes along with it will help keep chronic inflammation to a minimum, in turn lowering your chances of diseases such as obesity, diabetes, heart disease, Alzheimer’s and even some cancers. Given the fact that cinnamon in itself is a powerful anti inflammatory, adding it to a low GI diet will only enhance this effect. Cinnamon is a powerful anti fungal, anti microbial and anti bacterial; and is great in the treatment of fungal infections such as candida overgrowth. It can also inhibit certain bacteria like salmonella and listeria from growing. It is often used as a digestive aid to help eliminate gas and bloating; and is also great for alleviating IBS symptoms. The wonderful spice that is cinnamon, is actually higher in antioxidants than any other herb or spice. Antioxidants are an absolutely essential part of our diet because they mop up the free radical damage that is caused in our bodies by a continual toxic assault that comes from many sources such as junk foods, pollution, chemicals, pesticides, sun exposure, alcohol and nicotine. In fact, we are being bombarded from ALL angles by toxins every day, many of which we have no control over such as traffic pollution and aeroplane fuel. 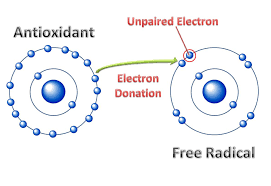 Free radicals are basically unpaired electrons that steal electrons from our own cells and thus causing damage to DNA. This damage then causes aging and disease, but eating high levels of antioxidant rich foods will help negate this damage and ultimately slow down the aging process. In studies on cinnamon’s effect on cancer cells and tumor growth it was shown to have an antiproliferative action on cancer cells, thus helping to stop them from growing. 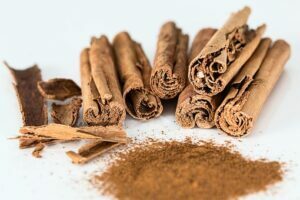 A separate study on mice with colon cancer showed cinnamon had the ability to activate detoxifying enzymes in the colon, therefore having a protective effect against further growth. These same results were also was seen in test tube studies of human colon cells to activate a protective antioxidant response. We may not have conclusive proof in humans yet, but it certainly won’t harm to sprinkle some cinnamon onto your morning porridge! The biggest killer of our time is heart disease, and it is something we all simply must take preventative measures against which is where cinnamon could be of help alongside a healthy diet and exercise plan. When it comes to lowering risk of serious diseases such as this then no one thing will work, it needs to be a series of changes, and an all round healthy lifestyle needs to be adhered to. A recent study concluded that a dose of just 120 milligrams a day can reduce bad LDL cholesterol and trigylcerides, AND actually increase good HDL cholesterol. Cinnamon is a very versatile spice and can be used in all manner of ways, so you need never be stuck for ideas when it comes to knowing how to add this spice into your life. After you have sourced out your real ceylon cinnamon sticks (don’t forget these are the FLAKY bark variety not the hard tubes) you can grind them up in either a coffee grinder or pestle and mortar and add to pretty much anything you fancy. Freshly ground cinnamon tastes just fabulous, and smells fresh and tangy. You can bake with it, sprinkle it on your cereal; or add to deserts, yogurts or hot drinks such as herbal teas or your bedtime milk. Go crazy with it and try new things, just be sure to get at least a teaspoon into your diet every day to reap all these awesome benefits. Thank you for your support of this website – I hope you have found the information you are looking for. Please feel free to drop me a line below should you need further help or have any other questions about this topic. I didn’t know there were different types of cinnamon. Great to know! It looks like I’m getting the cheaper quality version, and I’m not really happy about that. Where can I find the ceylon sticks? Do you think Whole Foods has them? Hi Christina, everyone is telling me they are using the wrong type of cinnamon now I have written this post. Iv’e stirred up a right hornets nest :). But yes you probably are using the cheaper one, in fact if it’s pre-ground then that may be all you will ever get – unless they specify on the label, but they never do, plus it would be a lot more expensive if it was the real stuff. I’m sure whole foods will do it, just look for the flaky sticks, they are very different from the hard curls so you can recognise them straight away. I myself have bought the flaky bark ceylon cinnamon on Amazon and Ebay before so you can definitely get hold of it. Also, you may find it a lot cheaper in some Indian stores (another place where I have found it hiding before). Hope this helps and good luck! Hey Stefanie, thanks for explaining the difference between Ceylon and Cassia cinnamon, I had no idea regarding the health benefits Ceylon has as opposed to the more dangerous Cassia cinnamon. My mum has been a huge fan of cinnamon for many years and sprinkles grounded cinnamon daily on porridge, I bet this will be the Cassia type the way you describe as her purchase regards a typical supermarket brand. She’ll be devastated when I explain the difference between the two types – ha! She’ll certainly make the change towards Ceylon cinnamon and ground it herself. Hi Simon, oh no I feel bad now for your poor mum! And yes, it will more than likely be the bad one, but if she is only having a little then it may be ok. Though I wouldn’t want to chance it, especially now I have researched it and found out what I have – sometimes ignorance is bliss hey? I did research this article extensively as I didn’t want to just say things without being 100% sure, but unfortunately it’s all true. If I were you I would get your mum on the flaky ceylon cinnamon, you can often buy it in Indian stores, or on Amazon/ebay. It is more expensive though. I eat cinnamon practically everyday in small amounts. I buy the grinded one in little spice bottles and it doesn’t say which one it is. What do you think? it’s probably the cassia one? 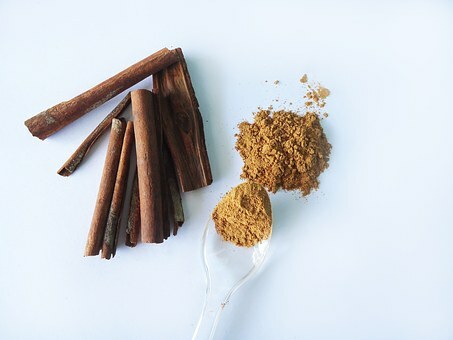 Hi Michiel, I use cinnamon every day too and it really does help control sugar cravings for me, but I definitely use the real one as I buy the proper ceylon cinnamon bark from the herbal apothecary where I work. Unfortunately, if you are buying the pre-ground from the supermarket then it is more than likely the cassia type which is a lot cheaper. This problem I am pretty sure about as I have researched it quite extensively and have read this time and time again. I don’t know if there is any way you can find out unless maybe you rang the company or something. If I were you and you want to start eating cinnamon for its medicinal benefits, then you should really try and get hold of the flaky bark and grind it yourself. I have actually bought it off of Amazon/ebay before so I know it is available. it is cassia indeed, found it. But I will look for my ceylon flaky sticks. Yes, thought it might be, I’m glad you checked. And your welcome for the information, let me know how you get on. This is some really interesting information. I had no idea that there was such a difference in the two different types of cinnamon, or that it could even be helpful in losing weight. especially the bad belly fat. Might be something I will look more into. Thank you for the help. Wow, I wasn’t aware that there two types of cinnamon. I’ll be looking for ceylon, can you suggest any organic suppliers? With so many benefits I need to get some soon. Thank you. Hi there, yes cinnamon has just amazing qualities doesn’t it? I’m taking it every day now but grinding it myself. Fortunately I work in a herbal apothecary so I can get hold of proper organic ceylon cinnamon. You have to make sure you get organic ceylon as I’m sure you can still get organic cassia cinnamon (which is the bad stuff), as it is still classified a cinnamon, that’s why I say you need to see the sticks with your own eyes to make sure it is the flaky variety. I don’t know where you live so I’m not sure if I can tell you where to go locally but I’m pretty sure if you googles organic ceylon cinnamon you could find a supplier…or just go to trusty old Amazon, I’m actually pretty sure I have ordered it from there myself in the past. I love cinnamon! I have come across your articles before, and your information helps me so much! I never knew cinnamon was good for you! My favorite benefit is that cinnamon can improve insulin sensitivity. I am planning to add this to my smoothies and protein. Is there a point where too much is not good for you? I hope to see your response, thank you, Stefanie! Hi Marques, thanks so much for the compliment, I am really happy you find my posts helpful. That is my aim ha ha. Yes, cinnamon is amazing, just make sure you get hold of the ceylon stuff as explained in the post, as a lot of it isn’t. I honestly don’t think you could take too much, unless you get maybe stomach problems from it. I have it every day at least 3 times. I put it on my breakfast, then have it in cider vinegar with lemon before dinner, and then I often have it in some almond milk at bedtime. I’ve never had a problem with it, and it definitely helps control sugar cravings. Very good post Stefanie, you always bring something new and informative. Indeed, cinnamon is really very important, I was aware about the health benefits but not as much as you have explained here, honestly. From now on I will use it regularly. Thanks for sharing this informative post. Yes, it’s such an amazing little spice and good for so many things. Plus it tastes amazing! Just be sure you buy the flaky variety if you want the best benefits. I knew cinnamon was good for health, but I didn’t know about its effects on glucose metabolism, and that’s just AWESOME. I’m gonna go online and find some quality cinnamon and order it to make sure I’m getting the good stuff – is there any brand in particular you recommend? Yes, keeping slim and keeping stomach fat specifically off, is ALL about blood sugar and keeping it low with low GI foods. So anything that reduces the insulin response like cinnamon is going to be great in the fight against the flab, lol. I’m really glad I’ve inspired you to get into taking cinnamon every day. It just has so many other health benefits and antioxidants that it is good for anybody to take, not just those who want to lose a few ponds and diabetics. I don’t take a particular brand as I get mine from the herbal shop where I work and we get it from specialist suppliers. But, in the past I have got it on Amazon and EBay and it’s been fine. Just remember to get the flaky bark variety called ceylon. If it’s got a flaky bark then it can’t be fake so don’t worry about that. I always buy Ceylon cinnamon but I don’t use it very often. I didn’t know that you have to take a teaspoon every day to reap some benefits. Thanks for another great post! Hi Blanka, yes a teaspoon per day is the best amount for blood sugar control and weight loss benefits. In fact, since I wrote this post I have been making sure to take it every day myself and I find it really does help control sugar cravings, especially at that time of the month when I usually suffer PMS and have no self control. So it’s great for me in that respect and I hope it has positive effects for you too! It’s good to know. Thanks a lot! No problem, I’m glad you found the post useful. Thank you. 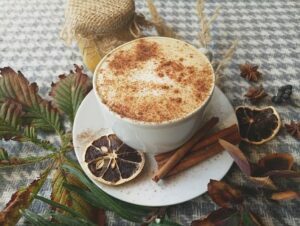 While researching for information about treating joint pain I bumped into a couple of articles that say how cinnamon can help reducing pain related to arthritis. I haven’t tried it because I’ve found a solution in regular exercise. Now I see it has much more benefits besides treating joint pain. Thanks for sharing this info. Hi Ivan, yes I can imagine it would relieve joint pain due to the fact that it is an anti inflammatory, so that makes sense. I’m glad you have found a solution to yours in the form of exercise; that’s awesome. But you could always add some cinnamon for all it’s other great benefits too! Thank you so much for this very interesting and helpful post on the benefits of cinnamon. I honestly did not know that there were different types of cinnamon and that one could be so bad for one. I shall make sure to purchase the correct one in the future. Love the idea that it can help for belly fat and also Diabetes. Will be sharing this post as I found it so helpful. Hi Jill, I am glad you found the post so helpful. Cinnamon is indeed a powerful little spice. In fact, since researching for this post I now have my whole family adding cinnamon to their breakfast cereals haha. It’s not so much that the other cinnamon doesn’t have the same benefits; it does. It’s more about it potentially being bad for your liver and kidneys if you have too much of it, so it could be a problem if you are eating it every day for therapeutic purposes. Wow, I’m so glad I’ve read this. I have cinnamon in my coffee every day, the premade powder though. I’ll definitely change that! It’s wrong how unclear food labels can be. This was so interesting, I didn’t know there were different health benefits to different types. I added it to my diet for weight loss, plus I love the smell. But clearly the list of benefits just keeps on going. I’ll visit the health store next time and get the real thing. I like the suggestion of having it with yoghurt too. Thanks for the heads up. Hey there, mmm cinnamon in coffee? Sounds great and I really need to try that! Yes, food labeling, especially for cinnamon is hard to understand and often won’t give you the information you want. Even on organic cinnamon it doesn’t always tell you and you can still get the organic cassia cinnamon (which is the bad one). They do both have the same benefits to be clear, it’s just that the casia can have liver and kidney implications if used every day. I find that I just prefer to buy the flaky rolls and grind it myself in a coffee or spice grinder. You can be absolutely sure of what you are eating then, and also the amazing fresh and aromatic smell you get when you do your own grinding is out of this world!